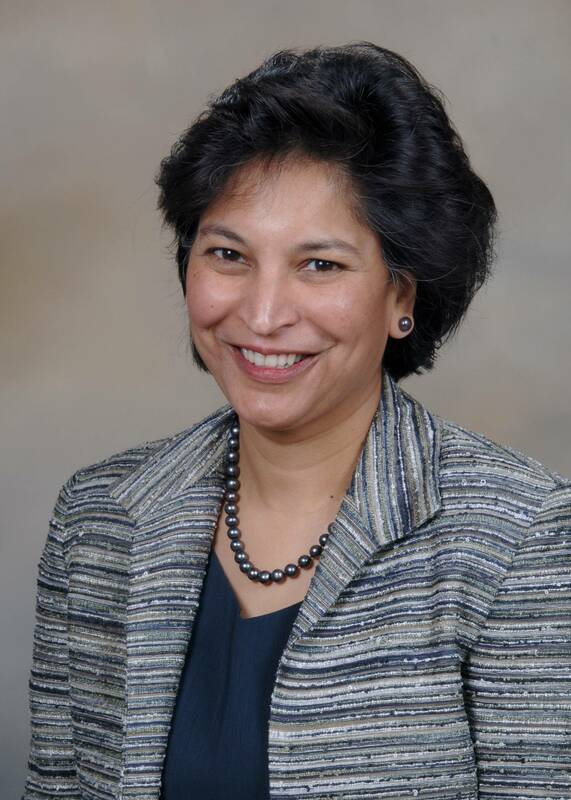 Cherie-Ann Nathan, MD, FACS, is the Jack Pou Endowed Professor and Chairman of the Department of Otolaryngology/Head and Neck Surgery at LSU-Health in Shreveport. She is also Director of Head and Neck Oncologic Surgery and Research at the Feist-Weiller Cancer Center. She completed her Otolaryngology/Head and Neck Surgery residency and head and neck fellowship in 1995 at University of California, San Diego. She was a post-doctoral fellow at Johns Hopkins where she started her research career. Following her fellowship she began her academic career at LSU-Shreveport. Her passion to improve outcomes for patients with head and neck cancer was the reason she moved from Mumbai India, where she went to medical school. She is a Surgeon-Scientist that maintains a busy practice treating head and neck cancer patients, thyroid, parathyroid diseases, salivary gland tumors and voice disorders and also leads an active research team. Her translational research program has been funded by the National Cancer Institute since 2000 and focuses on targeted therapy for head and neck patients. She is nationally and internationally recognized for her seminal work on molecular analysis of surgical margins and has pioneered multi-institutional clinical trials using mTOR inhibitors in HNSCC patients with Wyeth and most recently with Novartis. She has also received NIH funding for chemoprevention of cancer with curcumin and has a patent for a curcumin gum. She is also a team member of the COBRE grant for viral oncogenesis. She has published extensively and has over 170 publications in peer reviewed journals and has authored multiple textbooks and encyclopedia chapters. Read More..
Dr. Nathan has served on many National committees some of which include the NCI Steering committee and Task Force, the CDC-American Cancer Society HPV Task Force, board of directors for the Head and Neck Cancer Alliance, ASCO Program committee and Larynx Preservation Guideline Panel and the AAO-HNS Program and Nominating committee and Head & Neck CORE research leader. She has served on many committees for the AHNS including chairing the research, prevention and finance committee and is currently the Vice-President of the American Head and Neck Society. She is also Associate editor for the Laryngoscope Online journal “Laryngoscope Investigative Otolaryngology”. At the local level she is active, having been on the board of directors for Shreveport Medical Society, Disaster Reform committee and the Science Museum. The Shreveport-Bossier Commerce Department awarded her the Athena Award for community service and she received the Leonard Tow Humanism award from the Arnold Gold Foundation. The Board of Regents in Louisiana established the “Cherie-Ann Nathan Endowed Professorship in Otolaryngology/Head and Neck Surgery” initiated by grateful patients to honor her dedication and expertise. Dr. Nathan is married to pulmonary and critical care physician Raghu Nathan and they have two boys. Her favorite hobby is to perform with the “Nathan Family Trio” to raise money for the Arts and Cancer research in Shreveport. Dr. Burton J. Soboroff, a beloved physician and teacher in the UIC Otolaryngology Department, established the endowment that makes this Lectureship and Resident Research Symposium possible. His dedication to this department as well as the practice of Otolaryngology will be remembered for years to come. It is an honor for us to have this day to recognize the contributions of this great individual. Dr. Soboroff was educated at Northwestern University where he was Phi Beta Kappa, and received a Bachelor of Science degree in 1938. He attended Northwestern University Medical School , receiving his M.D. degree in 1942. Read More..
Dr. Soboroff then interned at Cook County Hospital from 1941-43; Residency at the Eye and Ear Infirmary at the University of Illinois College of Medicine and Cook County Hospital from 1946-1949 and Residency in Head and Neck Surgery at Hines VA Hospital in 1949-1951. He served in the Air Force Medical Corps from 1943-46. He became a Senior Attending in the Department starting in 1951 and was Interim Department Head in 1975-76 and 1977-79. After his retirement in 1988, at the age of 70, he held an Emeritus position in this department until he passed away in 2004. The Burton J. Soboroff Lectureship was established in 2001 and continues to be funded through gifts from former residents, colleagues, friends and admirers. We honor Dr. Soboroff and his contributions through this Lectureship.